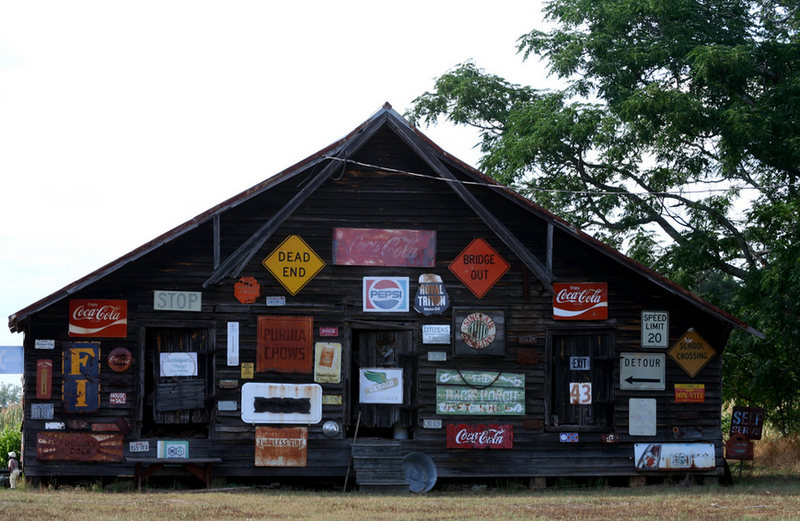 The Dash: Georgia And North Carolina Are Getting Really Poor Really Fast. But Why? Georgia And North Carolina Are Getting Really Poor Really Fast. But Why? Today I took a look at this data from the University of New Mexico. It compares the per capita income of every state since 1990, and their relative rank against the other states. It's fascinating. You can see the collapse of the manufacturing economies of Michigan and Indiana, and the boom of North Dakota's energy industry. And the tables also show that Arizona's boom was largely a mirage. And you can clearly track the collapse of incomes in Georgia and North Carolina. Between 1990-2012, both Georgia and North Carolina climbed their way to middle class, and then fell back again into the ranks of poor states. It's easier to see the data rather than read it. This is an inverse graph. The closer a line gets to the bottom, the richer the state. 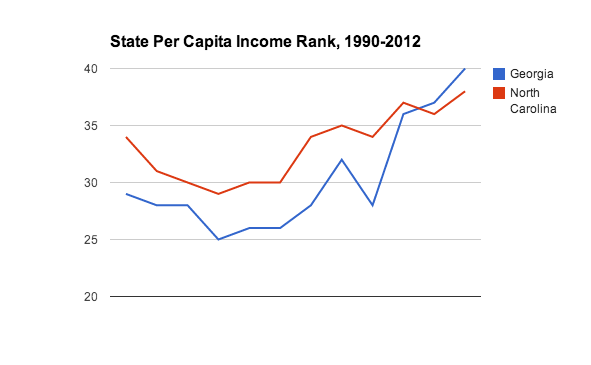 Two states have massive income swings: Michigan and North Dakota. North Dakota's dramatic improvement directly coincides with the oil and natural gas boom currently underway (it went from 38th to 12th in just six years). Michigan, in green, has been hard hit by the decline in manufacturing. It was the 17th richest state in 1994, and fell all the way to 39th in 2010. It recovered some ground (as has Indiana) by 2012. The gold line is Texas. 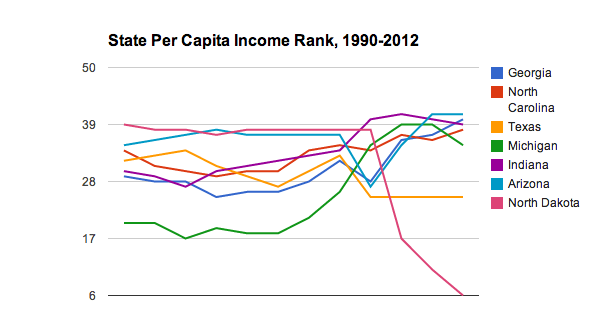 It bounced around the upper end of the bottom half of states for all of the 1990s. Then, between 2004 and 2006, the economy went into overdrive and never really looked back. It's been a respectable 25th in per capita income since 2006. So, what's happening to Georgia and North Carolina? Update: Here's a view of the same graph with just Georgia and North Carolina. Remember the closer the lines are to the top, the poorer the state is becoming. Despite being two of America's fastest-growing states for much of 1990s and early 2000s, both Georgia and North Carolina have been losing ground against their peers. While incomes in all states grew over the 22 year period, the South's sunbelt economies were comparatively stagnant. None of them (with the exceptions of Texas, Louisiana, and Virginia) improved their relative ranking very much. But Georgia and North Carolina stand out for falling precipitously over this period. Both achieved their income high water marks in 1996, when Georgia ranked 25th (where Texas sits today) and North Carolina was 29th (a spot now occupied by Louisiana). And unlike Arizona or Texas (which are holding steady) or Indiana or Michigan (which are improving), Georgia and North Carolina continue to fall. Looking at the relative data another way, Georgia's per capita income in 1996 was $23,340 and in 2012 it was $36,869 - a 57% gain. North Carolina did a little bit better, upping incomes by 63% over the same period. But Texas raised its average income by 86%, and the entire United States posted a 74% rise. External economic shocks are not to blame. Both states began their long, slow decline at the height of the Clinton economic expansion, and continued to plunge through the post-9/11 recession, the economic boom under President George W. Bush, and the Great Recession. Atlanta, Charlotte, and the Raleigh-Durham-Chapel Hill area were strong magnets for internal migration during this whole period. State politicians cannot be solely blamed either: Georgia switched from solidly Democratic to mostly Republican only in 2002, and North Carolina has had statewide split party control until almost the present day. Switching parties and governing ideologies at the state level clearly haven't helped either. What is clear is that the policy environments in these states are rotten, and both are on self-destructive paths. Whatever they are doing now, they should immediately stop and change course. The road both of these states have taken since the mid-1990s is a fast highway to economic and social ruin. Neither have much further to fall.